That's obviously still rough, but quite a few changes have taken place. You can see full texturing on the individual season books now. Those player portraits are placeholders, but you can get a general look at what the wall of honor is supposed to look like. Plus, I'm going to do a dynamic layout so that depending on the number of players on the wall of honor, the size and location of their portraits will change. Basically, on the left you have teams season stats, and on the right you have career totals for your currently active, named players. You can see that the player panel layout is sloppy right now, and the portraits are placeholders, but you can see the basic concept. 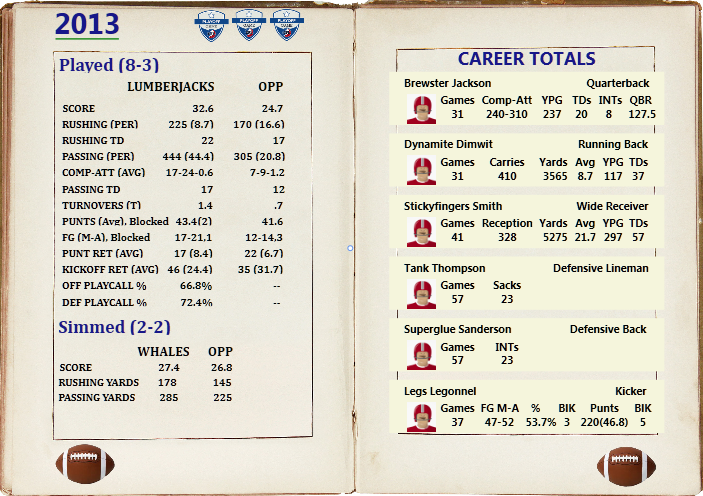 And yes, I am actually calculating a quarterback's QBR using the official NFL formula. I'd like to include a few simple graphs (like run-pass ratio), but I don't think I have enough room. Those little footballs for navigation are going to be replaced with little books with arrows on them, so that you can go from season to season without going back to the bookshelf. My target is to have this in the hands of the testers, fully functional, by August 1. That may be a bit ambitious, but that's the schedule. In terms of ambition, I noticed something interesting this week. The Wall of Honor is quite a rabbit hole, because you can go into so much detail and make it so elaborate with selection criteria and displaying all kinds of statistics. The problem, though, is that it's not time efficient at all, because players will only be inducted if they have exceptional careers, and that will take multiple seasons (probably 4+) to happen. I'm putting in a ton of fun time working on this one feature, but in the larger scheme of things, it's not very important. So to hopefully finish a version of this by the end of the month, I'm going to delay the Wall of Honor portraits and coding until the basic version is complete. 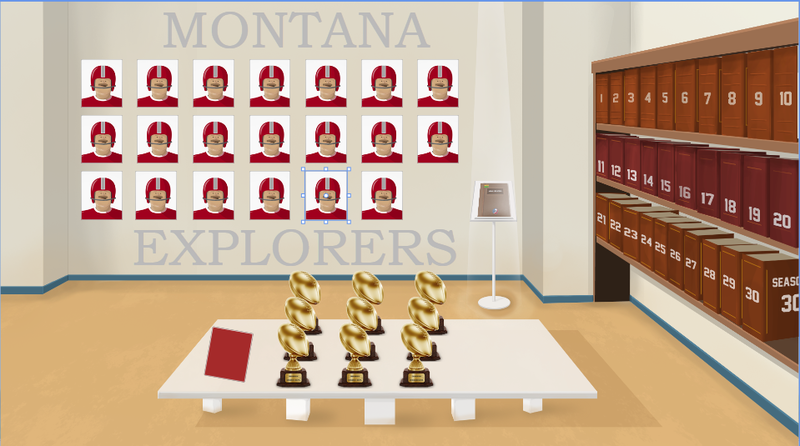 That basic version will have the enhanced season display, the bookshelf, and Gridiron Bowl trophy display. And a security guard. Don't forget about him.